Sabon typeface designed by Tschichold, and jointly released in 1967 by the Linotype, Monotype, and Stempel type foundries. Jan Tschichold created the font Sabon and based his typeface design on a version of Garamond designed by Jakob Sabon and Conrad Berner. It was inspired by an earlier Claude Garamond typeface Tschichold had seen on a 1592 specimen sheet printed by the Egenolff-Berner foundry. Classic, elegant, and extremely legible, the font Sabon is one of the most beautiful Garamond variations. The font Sabon is particularly good for text and headlines in: books/text, magazines, advertisements, documentation/business reports, corporate design, multimedia, correspondence. 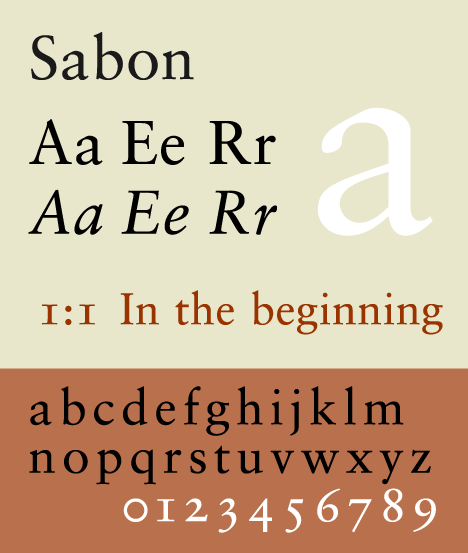 An early first use of Sabon was the setting of the Washburn College Bible in 1973 by the American graphic designer Bradbury Thompson. All books of the King James biblical text were set by hand in a process called thought-unit typography, where Thompson broke the lines at their spoken syntactical breaks. Sabon was also used as the typeface in the 1979 Book of Common Prayer of the Episcopal Church (United States), as well as all of that church’s secondary liturgical texts (such as the Book of Occasional Services and Lesser Feasts and Fasts). Sabon was used in the 2000s as the official logo typeface of Stanford University until 2012. It is also used by Örebro University, together with the typeface Trade Gothic. It remains a favourite among the discerning and it looks particularly good the bigger one uses it, which is why magazines like Vogue and Esquire use a slightly modified version of it for headlines.